↑ İnalcık 1991, पृ॰ 973. Kastritsis, Dimitris (2007). 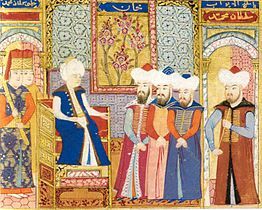 The Sons of Bayezid: Empire Building and Representation in the Ottoman Civil War of 1402-13. BRILL. आई॰ऍस॰बी॰ऍन॰ 978-90-04-15836-8.